West Virginia Democrats have booted 14-term Congressman Alan Mollohan is what could be a very bad sign for what is ahead for Democrats all across the country. Mollohan's Democrat opponent ran against his ethical issues and against Mollohan's support of ObamaCare. There will be a lot of that going on this Fall by Republicans! Tuesday night, Democratic primary voters in West Virginia showed 28-year Congressional veteran Rep. Alan Mollohan (D-WV) the door. Democratic state Sen. Mike Oliverio toppled Mollohan. Oliverio’s victory made Mollohan the first House casualty in what has already been a turbulent midterm election year. Mollohan is only the second House incumbent to lose in two election cycles. 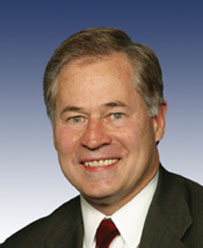 Former Rep. Chris Cannon (R-UT) lost his primary in 2008. Oliverio went after Mollohan’s alleged ethical lapses. And pro-life Democrats criticized Mollohan for voting in favor of the health care reform bill. . . But Mollohan’s loss could spell bad news for Democrats. In 1994, one of the reasons Republicans won the House is because they not only vanquished weak members and lawmakers from marginal districts, but wiped out big fish, too. That year, the GOP defeated House Speaker Tom Foley (D-WA), Ways and Means Committee Chairman Dan Rostenkowski (D-IL), Judiciary Committee Chairman Jack Brooks (D-TX) and others. Historically, the midterm election is usually a disaster for the party of the president in power. Going into this election year, Democrats knew they could potentially lose 25 to 30 seats. That’s consistent with midterm election history. But for the GOP to win the House, they have to knock off senior members. Like Mollohan.